We are conveniently located at 1808 Victoria Farms Road, 1 mile South of the Airport and one block East of Highway 95 off of Chenoweth Rd. We are the only facility in Lake Havasu City to feature three types of storage: traditional storage with space sizes from 5×5 to 10×20, Air Conditioned with space sizes from 10×10 to 10×20 and RV & Boat Storage with space sizes from 12×30 to 15×100 feet. Our Air Conditioned storage can handle residential and commercial storage. We provide a pallet jack, flat carts, furniture dolly’s and an appliance hand truck to handle items like refrigerators, washing machines and dryers. 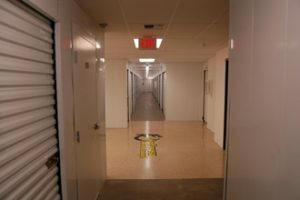 Our 2 story, Air Conditioned Storage Building is the first of it’s kind in Lake Havasu City to offer Residential as well as Commercial air conditioned. Air Conditioning (Not Swamp Coolers) means that you no longer have to worry about your expensive furniture, antiques and pictures from being covered in desert dust and deteriorated by the extreme summer heat. Our unique access control and digital video recorded camera system improves security over traditional older designs. We have two years of data indicating we are holding temperature to approximately 80 degrees. While we do not control humidity our ventilation and temperature control measures indicate an average humidity of approximately 25% even when the outside temperature hits 100 plus degrees. Our 2 story ACF has fluorescent lighting in the hallways that provide ample lighting for the storage spaces. We have taken extensive measures to provide you with security features like door alarms, fire sprinklers, high quality locks and extensive lighting throughout the entire property. Concrete tilt-wall construction embellished in tasteful art work. 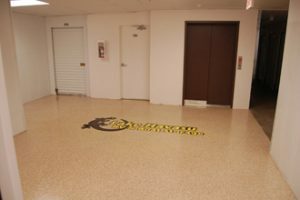 We offer a Highly Secure, concrete, two-story Air Conditioning to protect your sensitive equipment or belongings. Ten air conditioners pumps allow us to maintain approximately 80 degrees year round. Even if two air conditioning units go off line temperature will still be maintained. Our property was designed to provide a clean and fresh environment by filtering dust particles out of the air, just the way your air conditioning system works in your home. While we do provide equipment to control humidity our first 12 months records show an average of approximately 30 humidity. The hallways are clean with ample lighting. The entire property is a No Smoking area. All storage spaces have fire sprinklers. For security there are cameras that are linked to a digital video recording system that records activity in the hallways. Camera activity is visible in the office on large, wall mounted, flat screen monitors.